Name : The Full name of Prophet Muhammad SAW is Abū al-Qāsim Muḥammad ibn ʿAbd Allāh ibn ʿAbd al-Muṭṭalib ibn Hāshim . He is the last Prophet of Allah sent to humanity and he is the Prophet Muslim follow all over the world. When was Prophet Muhaamad(SAW) born and when did he die : Muhammad SAW was born in the year 570 of the Gregorian calendar in Mecca [Saudi Arabia]He died in the year 632 in Medina (Saudi Arabia). As his father had died shortly after marriage, his grandfather ‘Abd al-Muttalib became his guardian. ‘Abd al-Muttalib was the respected head of the clan of Hashim and the tribe of Quraysh, to which his clan belonged. Muhammad Saw then lost his grandfather and custodian ‘Abd al-Muttalib at the age of eight. When Prophet Muhammad (s.a.w) was twenty five years old, he was hired by a woman called Khadija to take her merchandize to Syria. Khadija, a widow fifteen years Prophet Muhammad (s.a.w)’s senior, later proposed marriage to him, which he agreed to. They lived together for almost a quarter of a century, until the death of Khadija about 8-9 years after the revelation of the Qur’an.Prophet Muhammad (s.a.w) did not get married to any other woman during Khadija’s life, despite the fact that polygamy was common practice in that society. It was in that cave in 610 CE, i.e. at the age of forty, that Prophet Muhammad (s.a.w) received from Allah the first verses of the Qur’an. The Qur’an continued to be revealed in fragments to Prophet Muhammad (s.a.w) over the following twenty two years. 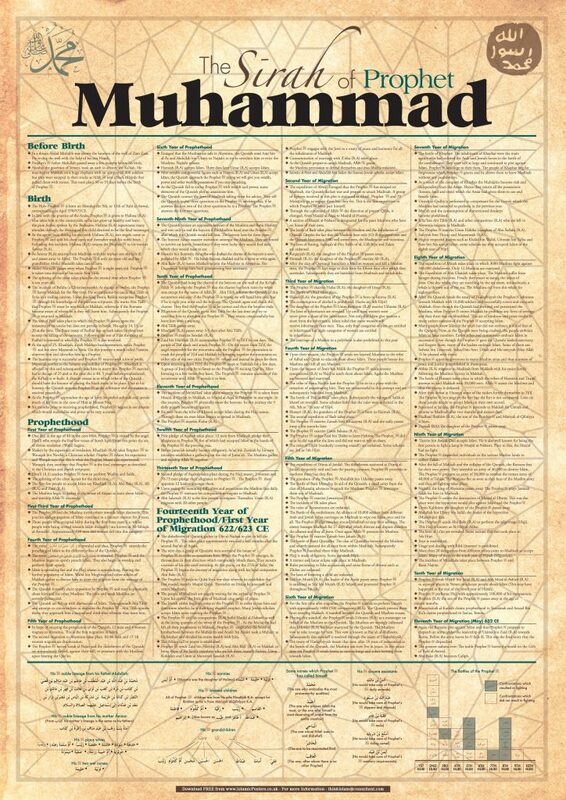 If you want to know more about the lineage of Prophet Muhammad SAW,you may like to View this rare lineage Chart . And If you want to read the full biography of Prophet Muhammad SAW ,then you might like to check this book. Let me share a more comprehensive Sirah of Prophet Muhammad SAW . I Recieved this Seerah poster of Prophet Muhammad SAW and found it very elaborate .This gives a Very nice introduction to the Life of our Prophet PBUH . Take a Look. The Prophet Muhammad (Peace And Blessing be Upon Him) is a central figure in the life and faith of Muslims. The story of his life is filled with inspiration, trials, triumphs, and guidance for people of all ages and times.